First things first, look out for the reflection of the building in Tofunmi's sunglasses. That's not just an ordinary building, but the Taj Mahal in India - one of seven new wonders of the world! And so much goes into getting a photo like that - timing, location and direction of the sun! Okay, now that's out of the way, let's have a proper introduction. I was looking through Instagram story when I saw Tofunmi's story and the location said 'Bangalore Airport India'! My first thoughts were 'what's she doing in India?'. I just hadn't pegged it to be one the places she'd jet off to. So when she confirmed that she was really on there on holiday and to attend her friend's wedding, I knew I had to hear the details of her experience! I don’t know the exact moment it happened but sometime in between the several hours I watched Indian movies as a child/teenager, I made it a “bucket list” item in my subconscious to attend an Indian traditional wedding in India. I also love to visit new places to explore the history, culture and art which India has in abundance so it was a no brainer when Smriti, my dear friend from grad school invited me to her wedding in Bangalore, India. I was super excited and started counting down even before she confirmed the exact dates. I traveled with my Ghanian twin Abenaa who coincidentally introduced me to Smriti when we were in grad school. I’ll say plan, plan, and plan ahead. Visa logistics was a bit of drama. The Indian High Commission in Nigeria have a very interesting approach to visa applications. Your host has to write you an email invitation with the Commission in copy and a paper copy of this must be presented at the interview. The tourist visa costs US$252 (that’s the highest I’ve paid for a visa in recent times) and it is payable only at the Commission, in cash and in the Naira equivalent after your interview is successful. Also, you cannot be issued a tourist visa earlier than 30 days before your trip. I had to make the trip to the Commission twice as this information is not on the website. My flight route was Lagos-Dubai-Bangalore with a total travel time of 11 hours(minus an average of 9 hours of layover in Dubai both ways). I was able to get a good deal on my ticket during the airline’s promo earlier in the year. The airline also provided complimentary visa and hotel accommodation in Dubai for the duration of my layover which made the long layover a lot more pleasurable. Enroute Bangalore from Dubai, with my Twin! For travel and activities within India, Abenaa and I split logistics handling between ourselves which made planning more efficient. We visited 3 cities in 7 days, stayed in 3 different hotels, visited numerous tourist sites and attractions and of course attended the wedding ceremonies. We booked flight tickets and hotels earlier on to get the best deals and sorted out the rest of the smaller details closer to the time of our trip. With Smriti’s help, we were able to plan all of these seamlessly. I had no expectations when I was leaving Nigeria but I was very impressed when I arrived India. The airport in Bangalore is a world class facility. It is well maintained and everything works including the wifi, air conditioning and escalators (hello MMIA!). The immigration process was really smooth and our bags were waiting when we got to the carousel. In the first 10-15 minutes of the drive out of the airport, I remained impressed with the clean and well lit roads. As we got closer to the city center, we were welcomed by the familiar hustle and bustle of a highly populated, fast paced city. We visited Bangalore, Agra & New Delhi. 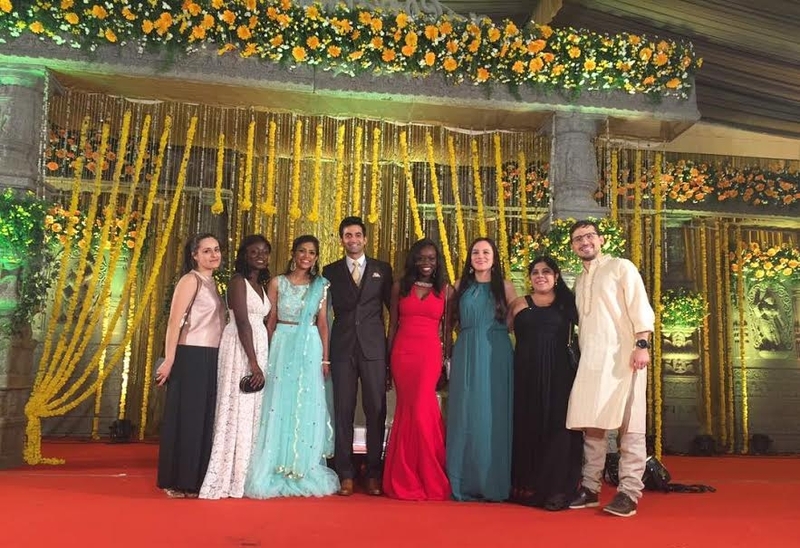 The highlight of Bangalore was the wedding and the people. The people in Bangalore are nice and the city has a really good vibe. Abenaa and I concluded at the end of the trip that if we had to pick somewhere to live in India, it’ll most likely be Bangalore. Sitting Pretty on the Royal Bench in the Bangalore Palace courtyard. Signature jump, outside the Bangalore Palace! Lalbagh Botanical Gardens in the middle of Bangalore. 97 hectares of greenery, ponds, a rock and other natural elements. Reminded me of Central Park, New York. In Agra, the Taj Mahal definitely stood out for me. The history, art and details which the edifice embodies is beyond amazing. Little wonder it is one of the seven new wonders of the world! Outside the Taj Mahal grounds. The domes represent the total number of years (20) it took to construct the Taj. From the Taj, you can see the Yamuna river, and the red bricks in the distance is the Agra Fort. At the entrance to the Jahangir Palace within the The Agra Fort. It has Buddhist, Christian, Muslim & Hindu religious symbols. The ruler who lived in the fort built the Taj for his wife. Also a UNESCO heritage site! The royal bath tub. Carved out of stone. The bliss of taking a sun and water bath at the same time. With our amazing Tour guide "Rocky Balboa" at Agra fort. The Indian sun was at its peak even the hats, sunglasses and sunscreen did little to protect us. The shopping experience in New Delhi was fun. There were lots of beautiful handmade items and souvenirs at ridiculously cheap prices. There is a less friendly vibe to foreigners in Delhi and that kind of ticked me off. Having some Keventers milkshake in New Delhi. The history of these milkshakes date back to 1889! I fell in love with Indian food when I was studying for the New York bar exams in 2015 so this trip was my way of rekindling that love as it has been difficult for me to find great Indian food in Lagos. I ate so much Chicken Biryani one would have thought I was on a mission to consume my quota of Biryani in this lifetime. I also love Mango Lassi and I made sure I had some on this trip. I tried traditional south Indian food (which is vegetarian) for the first time during the wedding ceremonies. I don’t remember the names but the food was spicy and made of vegetables, lentils and grains. Some of it I liked, the rest, not so much. I’m not ready to give up on my meat just yet! The traditional South Indian Cusinine. So vegetarian, that even the 'plate' is vegetarian! I also got to learn that the Indians love their sweets a lot. Every meal had super sweet sweets made with coconut, custard etc. to go with it. I’m not a sweet tooth so I tried those out for the experience. The movies are not far from reality. I attended a traditional south Indian Hindu wedding which was elaborate and colorful. I got to understand that weddings are considered one of the most important ceremonies in India and the celebrations are largely similar across the country. It is seen as a union between the couple as well as their families and a lot of time, money and effort is invested in ensuring its success. We attended 4 ceremonies in 3 days. Each ceremony with its distinct importance and several activities. The couple’s parents, siblings and the religious priests all played significant roles during the ceremonies to signify the marriage of the bride and groom. Like the movies, there was a lot of dancing, singing, exotic outfits, jewelry, flowers etc. With Abenaa. Our first time wearing the Saree. Of all the ceremonies, the Sangeeth/Mehendi night was most memorable for me. It was a gathering of the couple’s close family and friends colored with goodwill speeches for the couple, dancing (lots of it), singing, food and all round merriment. We also got lovely henna (called Mehendi in India) designs on our hands. The opportunity to take part in an Indian dance routine for the couple was also a fun filled experience. My least favorite part was not being able to follow some parts of the wedding ceremony. This is not because I was not paying attention but because none of us, including our Indian friends understand Sanskrit, an ancient language of Hinduism, which the priests spoke in officiating the ceremony. Thankfully our Indian friends were able to explain the significance of each part of the ceremony - my favorite being the 7 promises of marriage. Each promise is so profound and significant of the life time commitment and resolve of the couple to ensure the success of the marriage. Indian weddings are conceptually similar to Nigerian weddings. The ceremony is as important to the families as it is to the couple. Like Nigerian weddings, religion and culture are also significant features. A substantial amount of money, time and effort goes into planning the ceremonies attended by family, friends and well-wishers from far and wide. The importance of the marriage vows cannot be overemphasized. It is equally as important in Indian weddings as it is in Nigerian weddings. Smriti and Harish (the couple) gave us an elephant made of solid brass as souvenirs. Not only does it make a beautiful conversation piece, elephants represent wisdom and good luck in India. The intangible memories from visiting a new place is the most important part of any trip for me and I must say India came through on this one. Visiting the Taj and Agra Fort; walking through alleys in Malleshawaram, Sarojini Naga and Janpath; riding around Banagalore in a tuk tuk (Auto); taking in the beauty of the LalBagh gardens and Bangalore Palace and of course attending the wedding ceremonies; each of these experiences left me with beautiful memories that cannot be summed in one word. The addition to my knowledge of the culture, history and art is invaluable and definitely something I will cherish for a long time. I would have extended my trip by a few days and of course slightly increased my budget to accommodate a trip to Kerala to see the beautiful beaches. India is an amazing country with a wealth of human resources, art, history and culture. As a tourist, I was particularly impressed with how the country has carefully preserved its monuments and promotes tourism. I visited in the summer and the weather was incredibly hot especially during the day. I felt as though the Indian people are much nicer and friendlier in the south than in the north; maybe that has something to do with the direction of the sun! Like Nigerians, they are also fun loving people! ... for all the times people asked to take pictures with us and their family! So, even though I didn't want this feature to end, all good things must come to an end! I really did love this feature. But asides the amazing moments & experiences she's shared, I almost did cart wheels when she mentioned that totally travel time was just 11 hours from Nigeria. In order words Bangalore was just 3.5 hours away from Dubai. It definitely made a trip to India seems much more possible!! What are your thoughts? Have you been to India? Do you think you'd consider it for a holiday if possible? And on a lighter note, what are your thoughts on Indian movies and weddings? Let's hear ( and please leave a comment for Tofunmi & Abeena. 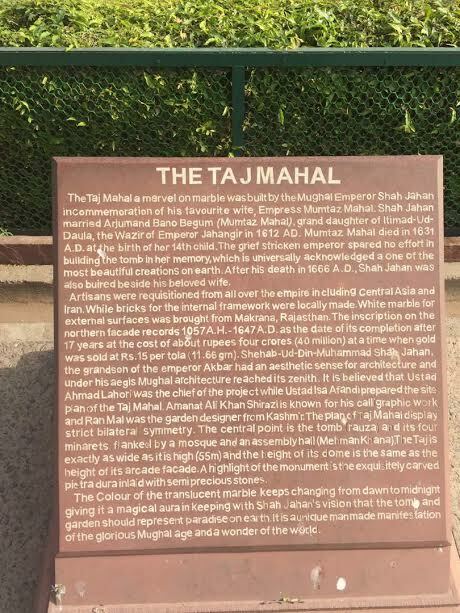 pS: Apparently the Taj was built by the ruler for his wife in her memory! Think anyone can pull of that kind of stunt in today's world? ppS: if you've got a travel post you'll like to share on here, feel free to holla! 30 Countries Before 30 - Ruchika Patel's Exciting Experience! Jun 26 9 People 1 Question - Female Travel Enthusiasts on Why They Travel, Must-See Destinations & Dream Passports!